In 2010, landmark health care reform was enacted through two federal statutes: the Patient Protection and Affordable Care Act (PPACA), signed March 23, 2010, and the Health Care and Education Reconciliation Act of 2010, which amended the PPACA and became law on March 30, 2010. To put it mildly, the legislation was controversial. 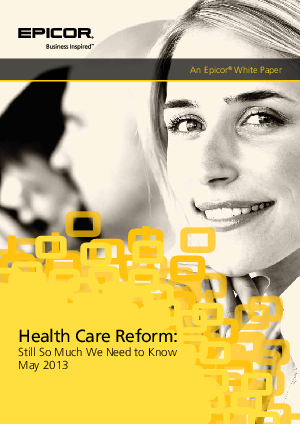 This white paper attempts to clear up some of the confusion about the requirements mandated by health care reform by addressing three key areas: reforms already in place, looming deadlines for employers, and open issues for individuals. Because the implementation process is a process, there are aspects to health care reform that remain open questions. We address the areas above with the information available at the time of publication.